I am rubbish at anniversaries. I always get the wrong amount of years, the wrong dates or with everything going on in our house; it just slips by. I love my husband, our kids; everything is just so busy. This year, it is different, this year I’ve remembered the date, I’ve googled “7yr anniversary theme” it’s copper or wool, I’ve ordered my husband a gift. I always try to give gifts some thought. 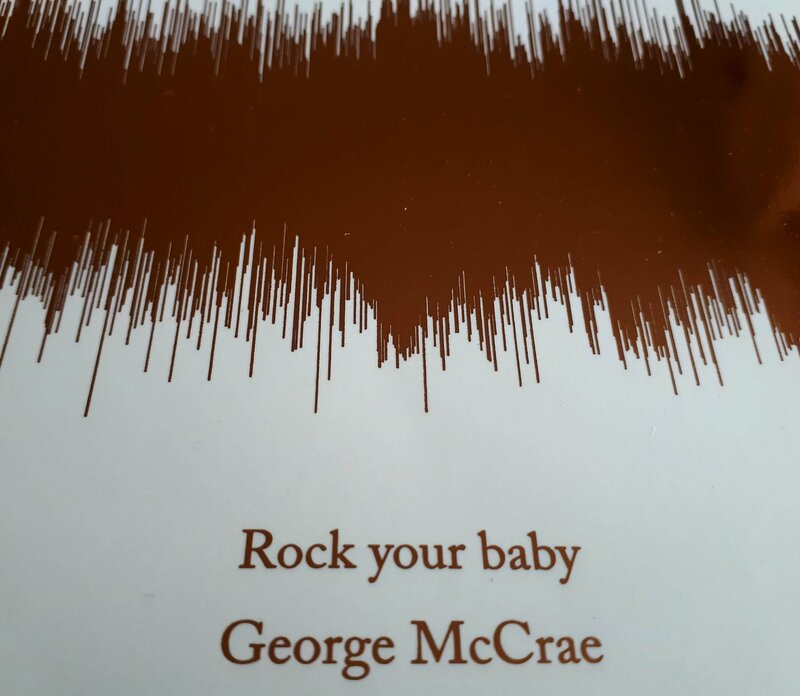 Our wedding song was “Rock your baby” by George McRae. We love a disco classic. Youtube it. One of the first hits is George in a tight blue, open shirt; so 1974. Well, I found someone who prints the sound wave of your song onto card in copper foil print. I ordered via Made by Mika through Amazon. I paid and promptly received a proof to approve before they produced the print. If tweaks or changes have to be made another proof is sent in 48 hrs. I sent back my confirmation that everything was good to go and 48 hours later it dropped on my doormat. The print quality is fantastic, lovely thick card and the copper foiling is blemish free plus wonderfully bright and shiny. They have printed my message, song title and artist as per the proof and request. My only query is “is the sound wave depicted actually of the song chosen?” I decided to test this out and downloaded a basic sound generator app for my phone and played our wedding song. It was the same. From the chorus section, if you ordered a bigger size you get more of the song; I ordered an A5. Big thumbs up. I’m going to frame it tomorrow and present on Monday. Hoping he likes the sentiment. He may well prefer a scarf.